My rating: hard story to read, yet a sincere sharing of pain and hope. How My Savior Leads Me is the true story of a family’s loss, the sudden and unexpected death of one of its children in February 2011. The author writes from a place of pain, all the while trying to trust God in her grief. Trent Stellrecht is a twelve-year-old boy who loves life as a young boy does, being adventurous, fun-loving, and outgoing. We are not told what exactly happened that tragic day, except that he died in a skiing accident while on a day trip with the youth group. But Terri is a woman who is still working through her own mourning, and has yet to find that place where life is still good. Having experienced loss in my own life, I know how hard it is to keep on when it seems the world should stop and take notice .. but it doesn’t. My other children needed me, perhaps even more, and I had to be there for them because life continued on. In How My Savior Leads Me, Terri Stellrecht shares while still in that place, so it is a read like no other you will come across. While I do not agree with all of the author’s theology, the age-old question people come up against has been raised and she has found some answers that work for her. As I read this book, it seemed the writing and sharing of her son’s death is serving as a way to work through a mother’s grief, that the shock has not completely left, and there is much healing yet to come. Terri Stellrecht uses her own photography throughout the book as she tells the story of Trent’s life. Also, if you are interested in listening to an interview with her please click on this link: radio interview Once there click on blogtalkradio on the right of that page. A winner will be selected in a week, the evening of June 12. 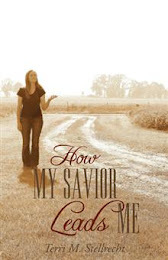 You can find How My Savior Leads Me listed on my BUY THE BOOK! page. This entry was posted in Mostly About Reading, Reviews & Interviews and tagged book giveaway, death of a child, family, grief, Grief Loss and Bereavement, How My Savior Leads Me, inspirational non-fiction, mourning, Terri Stellrecht, Trent Stellrecht. Bookmark the permalink. This sounds really really sad. This is an adult book, so it isn’t for me, but to answer your question, my parents and the Lord lead me when I have problems in my life. We pray together a lot. Yay, it’s letting me comment now. I’m not sure what happened the last two times I tried. Anyway, I turn to my family and prayer. This book sounds like a real tear jerker. I’m so glad you kept trying to comment, Kelly. 🙂 I don’t know what was wrong either. Thanks for visiting and for sharing what works for you in times of trial. Thanks for your book review. I always appreciate an honest review. If I were to die tonight, I know that I would be in Heaven…with our son who was killed by a drunk driver, with our baby who died before we even got to know him/her, with my mom, dad, grandparents, and many others who have gone before.